When the genius artistry of Kim Jung Gi’s drawing and the succinct urgency of Jean-David Morvan’s writing combine to tell the story of one of the world’s greatest photojournalists of the 20th century, it is a collaboration you cannot miss! And since this beautiful work contains original unpublished photographs from Steve McCurry, it is in fact not just a collaboration but a hat trick of exceptional talents, abilities and strengths. You may not recognize the name of photojournalist Steve McCurry, but you definitely know his images, including his famous National Geographic magazine cover featuring the striking Afghan Girl with green eyes. 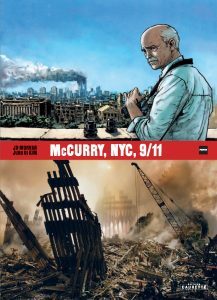 But behind the iconic pictures is the story of a man who has lived through and witnessed some of the most important events of the last century, including that particular day in September, 2001 when the World Trade Center towers fell. McCURRY, NYC 9/11 SEPTEMBER 2011 tells the events of that day as well as the stories behind the photographer’s life-changing journeys to places like Afghanistan, India, Tibet, and Kuwait to take the photos that still captivate the world. Steve McCurry’s personal recollections and experiences have never before been collected and published, making this particular biography a unique production. Especially noteworthy: this superb effort includes nearly 80 of McCurry’s iconic photographs, 8 of which have never been published before! This marvelous original biography, written and drawn in traditional graphic novel format by artist Kim Jung Gi and writer Jean-David Morvan is a tribute to Steve McCurry, a fascinating man of skill, perception and with a 6th sense regarding timing. We are honoured to present this special work to an appreciative audience. English version. If you want the French version: here.